Cow milk, ghee and gaumutra are beneficial in many diseases. 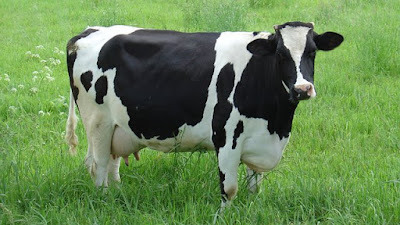 Cancer: Cow milk contains calcium, which prevents formation of cancer cells. It reduces the risk of breast cancer. Healthy Heart: Cow milk has high amount of vitamin B12. This reduces the risk of heart disease. Kidney Stone: Cow milk contains potassium and calcium keeps kidney healthy. This reduces the risk of kidney stone. Healthy Hair: Mix salt in cow ghee and apply it on hair. It stops hair fall. This will make hair thick and shiny. Thinness: Cow ghee has high amount of protein. The regular use of cow ghee reduces thinness and makes human healthy. Headache: Keep 2 drops of cow ghee in nose in morning-evening. It is beneficial for headache. It controls migraine problem. Constipation & Acidity: The regular consumption of cow ghee improves digestion. It is beneficial in constipation and acidity. Anemia: Drink mixture of gaumutra, triphala and cow ghee. It is beneficial in anemia. Weight: Keep 4-5 drops of gaumutra in one glass of water. Also, mix two teaspoon honey and one teaspoon lemon juice. Drink this mixture daily. It reduces weight. Acidity: Mix half cup water and one teaspoon gaumutra with salt and lemon juice. It is beneficial to cure acidity.